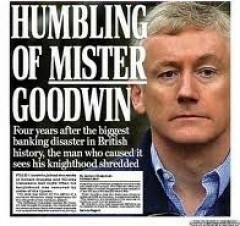 The humiliation of Fred Goodwin may have appeased a public baying for vengeance, but has done little to fix the broken global banking system or reverse the Second Great Depression. But then the public have been given very little leadership as to how to address the causes of this crisis. Politicians, economists, central bankers and think-tanks have both created an almighty mess, but also sown confusion as to the true reasons for catastrophic economic failure. Instead the public have deliberately been blind-sided, distracted into focussing on (a) the public sector and (b) a consequence of the crisis: the public finances. Fred Goodwin’s hounding shows that while you can fool the people some of the time, you can’t do so all of the time. Last week Jonathan Portes of the NIESR helped subvert some of the propaganda by boldly speaking truth to power. To the consternation of many he showed that the ongoing slump is now longer and deeper than the slump of the 1930s. While the players in stock markets remain unmoved by this truth, it unnerved the establishment and all those who insist on a disastrous form of economic bloodletting: austerity. These economic ‘quacks’ include MPs in all three major political parties; their friends in the City, the press and economics profession – and not forgetting those at the Institute for Fiscal Studies. Only a year ago the IFS followed the herd and urged the Coalition not to soften its stance on austerity. Now as contraction crushes the life out of the economy, hurts the poor and families with children, the IFS makes a mealy-mouthed appeal for “a significant short-term fiscal stimulus”. That IFS economists are not embarrassed by the contradictions and absurdity of their analysis is disturbing. That they remain unchallenged can only be explained by the sustained ideological drum-beat that drowns out sound economic analysis. The Bank of England helped silence some of this propaganda when it issued figures last week which show, unsurprisingly, that neither austerity nor massive taxpayer bailouts have restored the British banking system to solvency. In the absence of major re-regulation, it remains dangerously dysfunctional. Banking systems exist to lend money into the economy. Not so today’s. British banks are so over-leveraged (i.e. insolvent) that they cannot fulfil their role as lenders. Instead of acting as a lending machine, the British banking system, bizarrely, is now a borrowing machine. Like giant vacuum cleaners, banks are hoovering up the nation’s public and private resources, while refusing to lend, except at high rates. The Bank of England data shows that banks siphoned up £11bn more from the real economy than they lent to firms last year. And to compound the damage, bankers borrowed from the nationalised Bank of England at rock-bottom rates, and then lent to firms at high and rising, real rates of interest. This helps explain the ongoing slump that characterises the Second Great Depression. Banks are charging a whopping 20% for authorised overdrafts – and rates are set to rise higher. Despite this massive spread, they are still not raking in enough to clean up their balance sheets, render banks solvent, and start lending again. And still government and the official opposition turn a blind eye. Neither proposes to radically re-structure and re-regulate Britain’s broken financial system – to subordinate arrogant bankers to their proper role in the economy, and to restore stability. This article first appeared at the Staggers. When are we going to get serious with the bankers? Who rules Britain? The Bankers. Posted in: Economy, Finance, Macroeconomics. “Banking systems exist to lend money into the economy.” Um, no, they exist to create money into the economy. When you get a bank loan, there’s no loan, no transfer of funds, the money appearing in your account is new money. How come? Well, used to be any private bank could print banknotes. That got messy so they fixed it so only the BofE could print banknotes, as is still the case now. What they never thought to fix though was that the time would come when private banks (LloydsTSB, NatWest, all of’em) could create digital money. That’s where money comes from these days though it’s not understood by many people. But that’s the real problem, the banks are in charge of the money supply and no government has the balls to take it away from them. Articles like this, that say the press etc miss the point, are quite correct. But the articles themselves miss the point too. Kay…thanks for this, and glad that you have been following the ‘Positive Money’ story. But you misrepresent what was written. “Banking systems exist to lend money into the economy”. Not banks, or bankers, but banking systems. The point of the piece (to reprise): our banking system no longer does this. Instead the banking system borrows from the economy.